Further down the river, you pass the Aamodt Bridge. 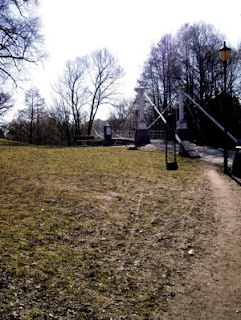 It is a chained hanging bridge, constructed in steel, in 1855 and used to cross the Snarum River at Aamot, in Buskerud County. It was considered an engineering masterpiece when it was constructed. After falling into disrepair, it was given as a gift to the city of Oslo in 1952, and moved to its present location in 1962. If you pass over the bridge with other people you will feel a distinct movement in the whole construction.